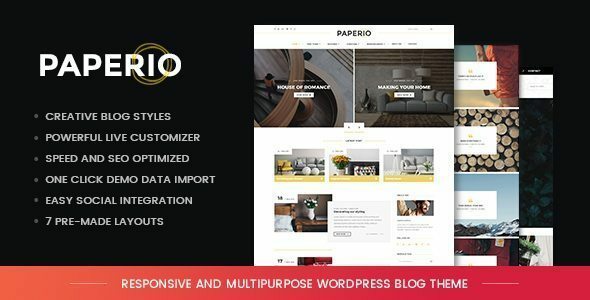 Paperio is a new WordPress theme for bloggers who want to ensure their blog not only looks great but is packed with useful features. This theme is fully responsive on different devices such as smartphones, tablets, and computers. Most wordpress themes offer just 1 demo and that’s it, with Paperio, you have seven demos to choose from. This is great to see because you have options of doing a theme change in the future and just customizing the new look. Saves money in having to buy a new theme. Did you know that these 7 demo’s available, all of them are in different niches? As I said early, you can customize each one to suite your blog. With these stylish layouts and have unique homepage layouts on each demo version, there are unlimited combinations on how you set up your theme. If you are comfortable editing the theme files, add your own finishing touches to each template. Paperio offers charming, visually stunning and engaging multiple blog layouts for the homepage featured area and for other pages such as the grid, list view and masonry options. All the different post types like standard, image, gallery, video, audio and quote are well-integrated and highly flexible to achieve your desired listing style with all the possible ready options to make it more suitable as per your blog type like fashion, photography, adventure, food, business and others. Remember, with Paperio, there are 7 unique blog layouts available to mimic different listing styles with featured and popular blocks to showcase various posts on the homepage. My favorite part about this theme is the responsive and nice looking featured area sliders, with inbuilt social sharing and powerful post types with audio, video, gallery, slider, quote is also a plus to add attract readers. This theme includes 7 demo’s which are all great in their own right. Importing them into your site is a straightforward process. All that’s left to do is choose which demo you’d like to use and that is always a hard decision. The pre-made demos can be imported quickly with an easy import process that filters certain options to either import the whole demo or specific items like pages, posts, widgets, settings and others. If your blog is not brand new, do not important content as you will have to delete menus, posts and pages that was automatically created by the import feature. Paperio gives you the option of previewing the demo versions before making a decision. When you are ready, clicking the Install button starts the process. It’s a great idea to have the ability to decide which elements that you want to import. However, most users will probably want to import the entire demo website to have less things to customize. While the import is taking place, you’ll be given a constant update on the progress. However, the whole process took less than a few minutes and was over without a hitch. At the end, you’re invited to install and run the Regenerate Thumbnails plugins. This free plugin helps ensure all the featured images are optimized for your website. When done with this plugin, you can uninstall it as it won’t be needed till you switch to a new layout. Paperio makes it easy to personalize your website through the WordPress default customizer which is in your “appearance” tab in your dashboard. See the example below. The customization panel includes the overall styling, layout options, featured image, content presentation, fonts, colors, and much more. As you experiment and make changes to your theme, you will get a live preview in WP customizer panel of what effect the changes are having. Social sharing, social following and social feeds are the must have feature nowadays to have social interaction and make your followers aware of your website and the content. 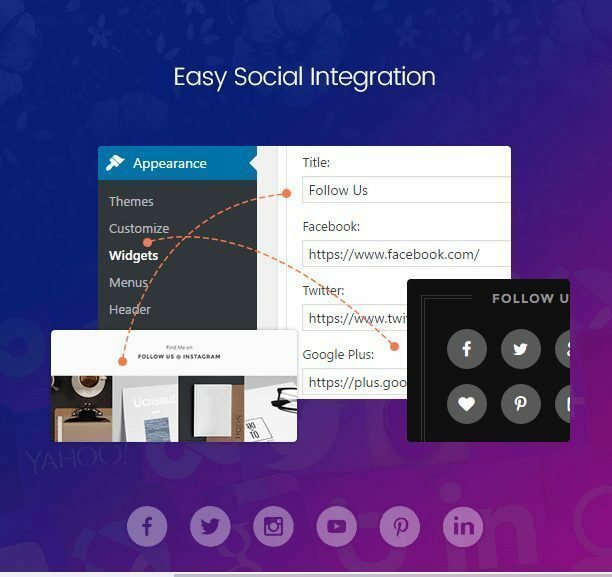 Paperio thought before hand about this and implemented sharing for all major social platforms, providing nice social profile icons as well as custom widgets for Twitter and Instagram feed. Getting social is a great way to get to know your audience which helps you provide them a great experience on your blog. Moreover, it includes SEO rich snippet review Microdata to enhance your search result and improve your website’s online visibility. 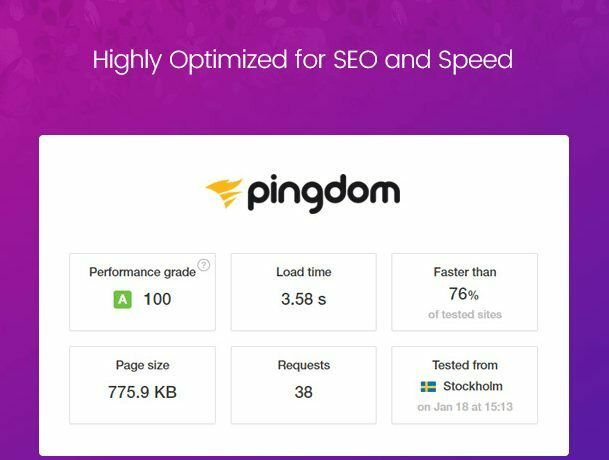 Paperio Theme is also fully optimized for SEO which assures you that your website will become visible on the web and comes with built-in mobile friendly version. The theme is also optimized for best performance and is highly fast and speedy. Below is the result of Paperio theme speed. This theme offers tons of awesome Promotional block shortcode to showcase promotions and widgets to make website development faster and easier. It boasts its eye-catching typography that you can effectively use for making a statement about your brand. It has a Mega Menu plugin that lets you create awesome drop-down menus for your website. It’s smart mega menu also enhances the usability and navigation of your website. Here are some of the reviews by Paperio Theme users on ThemeForest. Just one last thing to mention. A lot of web developers are in love this theme because it is child theme ready and offers an extensive online support and offers free lifetime updates. Plus they can customize each layout per client they are doing work for. Most of the design is done so they just customize the theme files to add things the client wants. I’ve been quite interested in this theme from the getgo! However, I can not find ANY ( if there is such) documentation on the Adsense and or ad placement options ANYWHERE…! Any info would help a lot!